The Ducks offense was interesting last week. I felt like I was watching an Ohio State game with two quarterbacks rotating every few drives or even mid-drive. 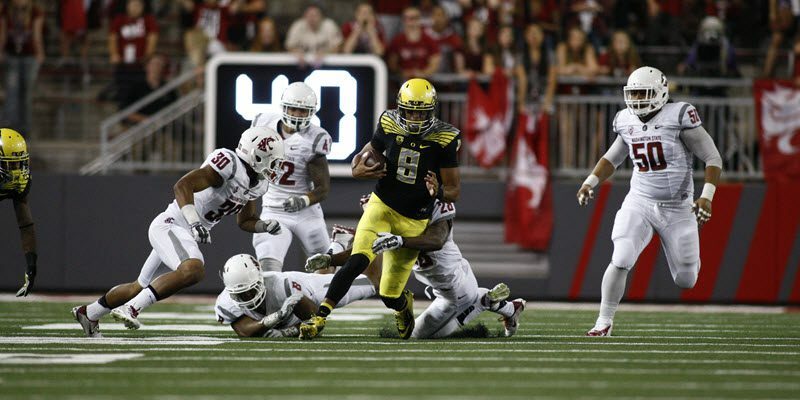 Coach Mark Helfrich has said that he may continue with this rotation between Jeff Lockie and Taylor Allie as long as Vernon Adams is recovering. I don’t know if I completely agree with that, but I’m here behind my computer, so what can I do? This week, the Cougars lie ahead of the Ducks. Washington State is 2-2 this year, but is as potent as ever with Mike Leach, the Cougars’ head coach, running the offense. Any doubts? Ask last year’s Ducks team. The Cougars don’t have much of a run game, as Leach is the king of the Air Raid offense, but they still run the ball to keep the defense somewhat honest. So, let’s take a look at one of their favorite run plays. The Cougars run game keeps the defense somewhat in check. 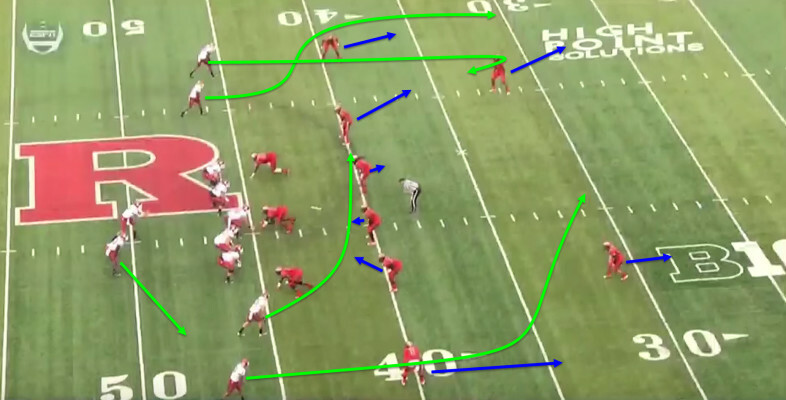 As you see in the screenshot above, the Cougars’ offense is lined up in the gun with a running back to either side of the quarterback and a receiver wide right and two receivers wide left. The defense is lined up across from the offense in a 3-4, 4-3 hybrid. The threat of a possible qb run makes the cutback possible. Even if the defense knows a run is coming, they don’t know where it’s going to come from since there are two backs. So, the offensive line will get a jump on the defense. At the snap, the offensive line is going to leave the left defensive end/outside linebacker unblocked as he has to worry about the threat of the quarterback run. 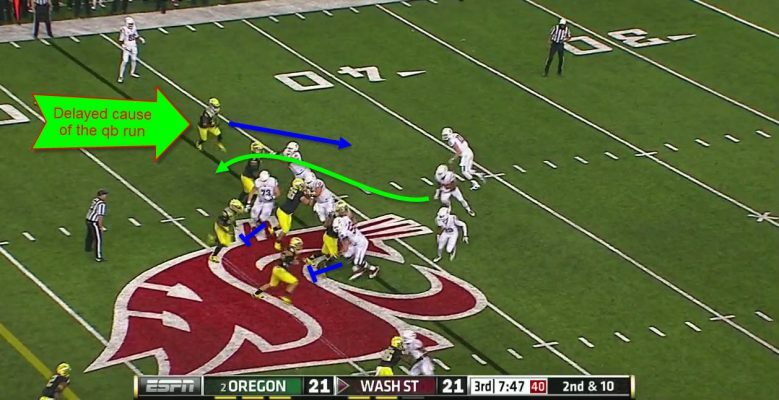 The line is going to try to seal off the edge for the running back so he can get to the outside. Cougars running backs can be elusive and quick. The linemen get to the second level and get to two linebackers, which is key. The running back sees that the Oregon defense has over-committed. So, he makes a beautiful jump cut back outside of the right guard and gets a very good gain of six. A gain of 6 on a run is a big win for the Washington State offense. Even though the run game is technically present, the Ducks defense is preparing for the ever-so-deadly Cougar passing attack. Luke Falk, the Cougars’ quarterback, has the second-highest completion percentage in the Pac-12 and third in the nation, at 72.8%. (Cody Kessler of USC leads the Pac-12 with 73.0%.) Falk also leads the conference in passing with 365 yards per game. Cougar receivers are great at finding holes in the zone. As you see in the screenshot, the Cougars are in doubles with the quarterback in the shotgun and a running back lined up to his right. The Rutgers’ defense is lined up in a 3-3-5 across from them. The linebackers are sucked in by the drag route and the safeties are otherwise occupied. The two receivers wide right are running a post and drag route. The two receivers on the left are running a deep curl route and an out-and-up. 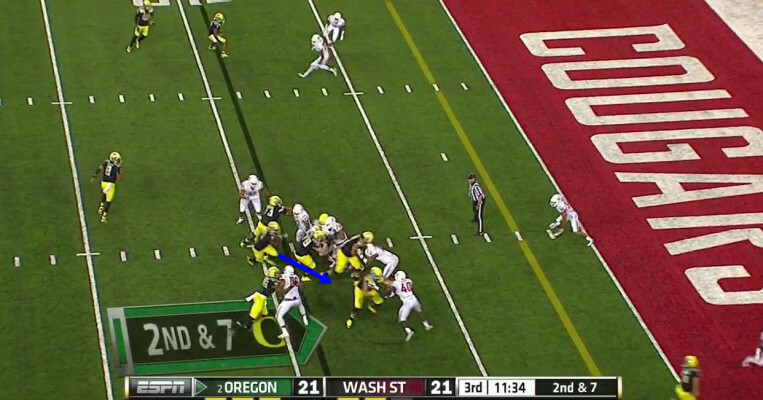 After a few seconds of pass blocking, the running back is going to leak out of the backfield. 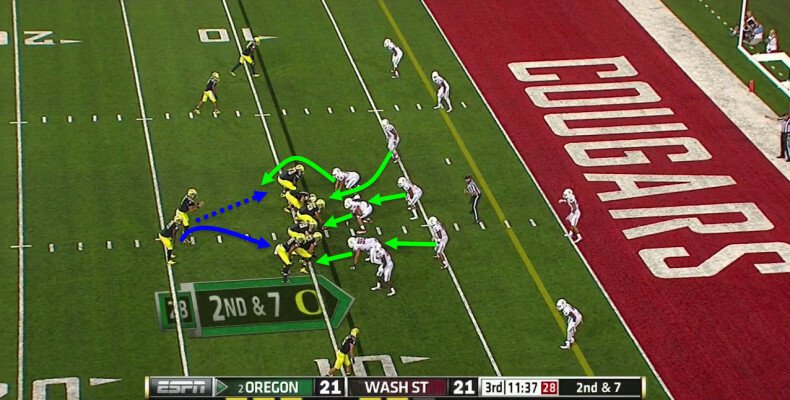 The defense is playing a zone, as Oregon often does, and the linebackers get sucked in by the drag route and don’t realize that there is another receiver behind them. If the receiver running the post wasn’t open, the running back was wide open. 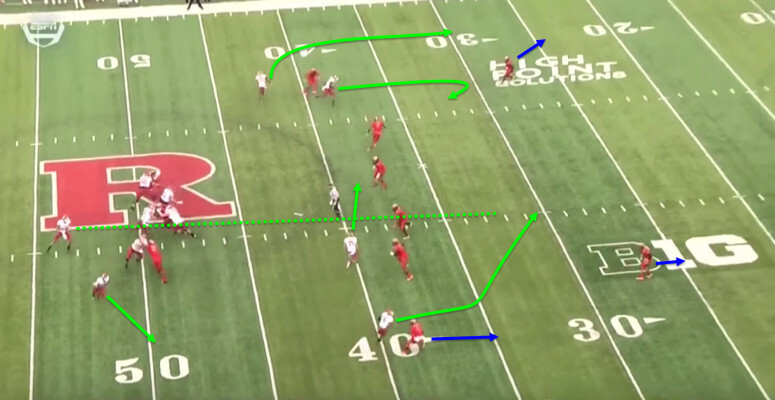 The deep curl route by the receiver wide right draws the safety in creating just enough space for Falk to fit the ball between the two safeties and right to the receiver. In the Colorado game, you may have noticed that it seemed like every other play, the running back was catching a short two-yard swing pass and running for another 15 yards. 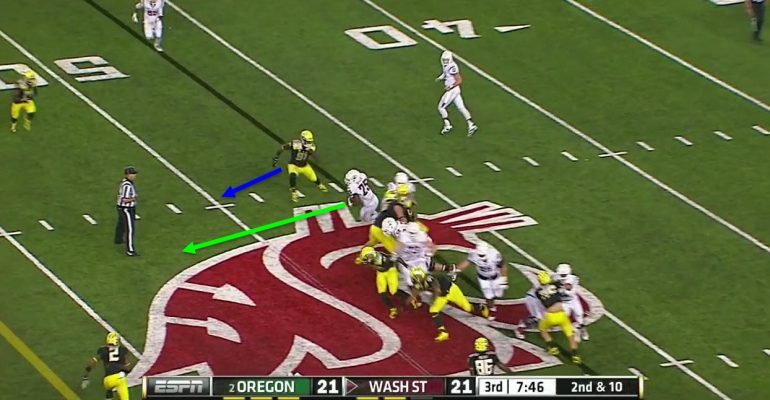 This does not bode well for the Ducks as the Cougars leak their running back often. Speaking of defense, the Cougar defense has improved from last year. Let’s take a look at how the Cougars are going to keep improving. The Cougars defense can create some confusion, occasionally. 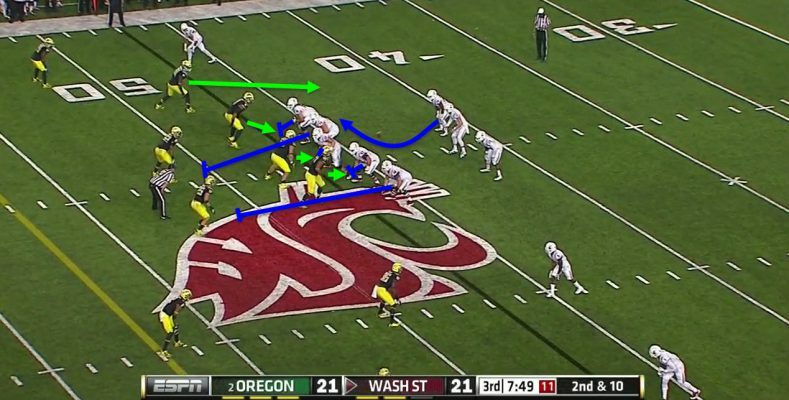 In last year’s game, the Cougars confused the Ducks’ offense a few times. They did this in a 3-4 defense with one of the linebackers usually pass rushing. The Ducks are lined up in their standard zone read formation. Defensive linemen take up blocks to free up the linebackers. At the snap, the Cougars’ right defensive end, the read man, is going to take the quarterback. The rest of the defensive line is going to rush off the offensive linemen’s right shoulders. This is going to force the running back inside. The defensive linemen are also going to eat up blocks to keep the linebackers free. Free, unblocked, linebackers are able to make plays. The quarterback is forced to hand the ball off to the running back as the right defensive end has him covered. The running back is forced inside into the waiting arms of the linebackers who were loose. 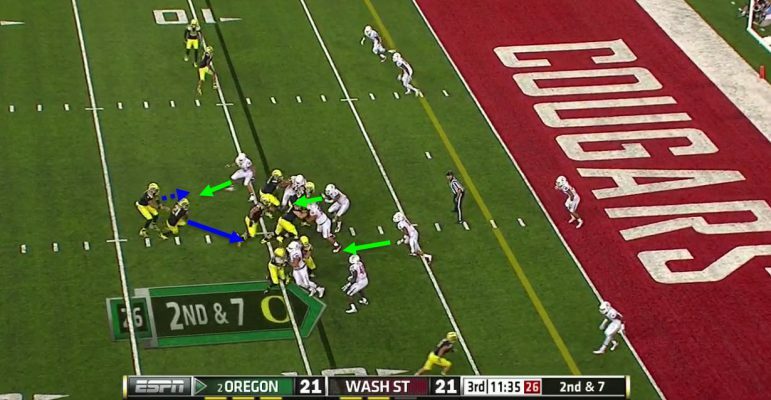 The Ducks are going to have to make sure the Cougars defense doesn’t gain any momentum. The Cougars defense is definitely the weak spot of the team. Where they are lacking in defense though, they make up in their offensive fire power. As I said, the offense has a ton of potential and can break out at any moment. This being said, I think the Ducks’ offense is going to somehow find a way to get consistent with Allie and Lockie at quarterback. Ducks squeak one out, 42-31.